Decker, A., G. Koehler, S. Morgan, K. Luckett, and W. Retzlaff. 2015. Native plant survival on a Mid-western green roof. Cities Alive 13th Annual Green Roof and Wall Conference Proceedings. 12 pp. Steck, T.J., S. Morgan, W. Retzlaff, and J. Williams. 2015. Insect communities on green roofs that are close in proximity but vary in age and plant coverage. JOLA 2:1-11. Decker, A., G. Koehler, K. Luckett, S. Morgan, and W. Retzlaff. 2016. Evaluating native plant survival on a Mid-western green roof. Oral presentation at the 108th Annual Meeting of the Illinois State Academy of Science, SIUe, Edwardsville, IL, 15-16 Apr. Buckles, B., J.S. MacIvor, and W. Retzlaff. 2013. Colonization of green infrastructure by cavity nesting bees and wasps. Oral presentation at the 105th Illinois State Academy of Science Annual Meeting, Illinois College, Jacksonville, IL, April 5-6. Buckles, B., J. S. MacIvor, and W. Retzlaff. 2013. Colonization of green infrastructure by cavity nesting bees and wasps. Poster presentation at the Second Annual Sustainability Conference, Webster University, St. Louis, MO, April 12. Buckles, B., J. S. MacIvor, and W. Retzlaff. 2013. Colonization of green infrastructure by cavity nesting bees and wasps. Poster presentation at the SIUE Undergraduate and Creative Activities and Senior Assignment Symposium, Edwardsville, IL, April 22-23. Buckles, B., J. S. MacIvor, and W. Retzlaff. 2013. Colonization of green infrastructure by cavity nesting bees and wasps. Oral presentation at the St. Louis Area Undergraduate Research Symposium, St. Louis, MO, April 27. Steck, T., W. Retzlaff, and J. Williams. 2011. Influence of age and plant coverage on insect communities on green roofs. Poster presentation at the 103rd Annual Meeting of the Illinois State Academy of Science, Eastern Illinois University, Charleston IL, 8-9 April. Gibbs, J., K. Luckett, V. Jost, S. Morgan, and W. Retzlaff. 2006. Evaluating performance of a green roof system with different planting mediums, sedum species, and fertilizer treatments. Poster Presentation @ Illinois State Academy of Science, 98th annual meeting, April 20-22, 2006, University of Chicago, Chicago, IL. Decker, A., S. Morgan, K. Luckett, G. Koehler, and W. Retzlaff. 2015. Evaluating native plant performance on a Midwestern green roof. Poster at the 107th Annual Meeting of the Illinois State Academy of Science, Western Illinois University, Macomb, IL, 10-11 April. Henderson, A., R. Krutsinger, B. Greeling, K. Luckett, V. Jost, and W. Retzlaff. 2015. The evaluation of Sedum cuttings as an establishment method on Midwestern green roofs. Poster at the 107th Annual Meeting of the Illinois State Academy of Science, Western Illinois University, Macomb, IL, 10-11 April. Christensen, M., K. Thompson, M. Ostendorf, M. Woolbright, S. Morgan, S. Celik, and W. Retzlaff. 2015. Evaluating long-term Sedum green wall coverage. Poster at the 107th Annual Meeting of the Illinois State Academy of Science, Western Illinois University, Macomb, IL, 10-11 April. Schuchman, R., N. Guehlstorf, S. Morgan, and W. Retzlaff. 2015. Roof coverage by native and Sedum plants in green roof systems at various media depths. Oral presentation at the 107th Annual Meeting of the Illinois State Academy of Science, Western Illinois University, Macomb, IL, 10-11 April. Decker, A., G. Koehler, S. Morgan, K. Luckett, and W. Retzlaff. 2015. Native plant survival on a Mid-western green roof. Oral presentation at the Cities Alive 14th Annual Green Roof and Wall Conference, New York, NY, 5-7 Oct.
Decker, A., K. Luckett, G. Koehler, and W. Retzlaff. 2014. Evaluating native plant performance on a Midwestern green roof. Poster at CITIESALIVE 12th Annual Green Roof and Wall Conference, Nashville, TN, 12-15 Nov.
Decker, A., K. Luckett, G. Koehler, and W. Retzlaff. 2014. Evaluating native plant performance on a Midwestern green roof. Poster at the 106th Annual Meeting of the Illinois State Academy of Science, Governors State University, University Park, IL, 25-26 April. Retzlaff, W. 2012. Using Sedums on green roof systems. Presentation at Weekend Gardner Conference, University of Illinois Cooperative Extension, Gateway Convention Center, Collinsville IL, 17 March. Krutsinger, R., B. Greeling, S. Morgan, K. Luckett, V. Jost, and W. Retzlaff. 2011. The evaluation of Sedum cuttings as an establishment method on Midwestern green roofs. Poster presentation at the 103rd Annual Meeting of the Illinois State Academy of Science, Eastern Illinois University, Charleston IL, 8-9 April. Richter, L., W. Retzlaff, S. Morgan, K. Luckett, and V. Jost. 2009. 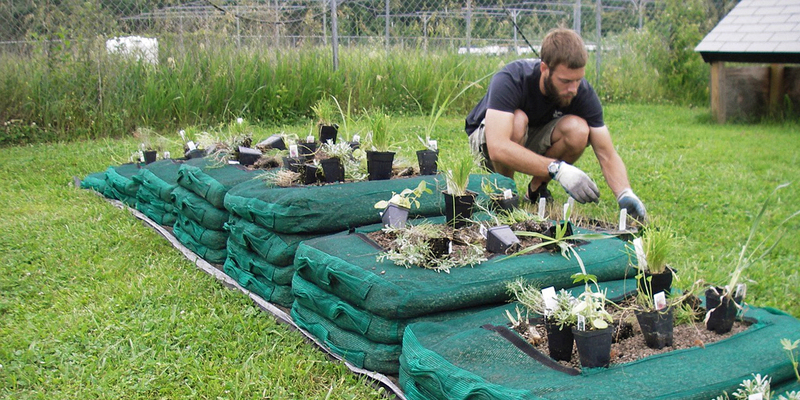 Evaluation of nine native plant species planted in four growth media depths for extensive green roofs. Poster at Visions of a Sustainable Mississippi River Conference, Doubletree Hotel, Collinsville IL, 10-13 August. Richter, L., W. Retzlaff, S. Morgan, V. Jost, and K. Luckett. 2008. Evaluations of mixed Sedum species plugs on a green roof system. Poster at 100th Annual Meeting Illinois State Academy of Science, Urbana-Champaign, IL. 4-5 April. Gibbs-Alley, J., K. Luckett, V. Jost, S. Morgan, and W. Retzlaff. 2007. Evaluation of a green roof system with various sedum species, growing media, and fertilizer treatment. Oral Presentation at 99th Annual Meeting Illinois State Academy of Science, Illinois State Museum and Lincoln Land Community College, April 20-21, 2007. Schaefer, H., K. Luckett, V. Jost, S. Morgan, T. Yan, and W. Retzlaff. 2006. Effects of green roof growth media depths on sedum immergrauch establishment. Poster Presentation @ Illinois State Academy of Science, 98th annual meeting, April 20-22, 2006, University of Chicago, Chicago, IL. Hise, C., V. Jost, K. Luckett, S. Morgan, T. Yan, and W. Retzlaff. 2007. Evaluation of Sedum ternatum in a shaded green roof system. Poster at 99th Annual Meeting Illinois State Academy of Science, Illinois State Museum and Lincoln Land Community College, April 20-21, 2007.